“Not long enough you old rascal,” I reply. My hands go out to raise him up. He sighs. Veined hand resting on mine where it grasps his shoulder. I step around him and walk on, head lifted to the sun flickering on my face. Through buttresses of sunlight that seem to support the high narrow windows. Sunlight aswarm with disturbed dust motes. The painted terracotta tiles passing under my feet. “He awaits you padre.” With surprising agility he is in front of me again, pushing the door open. “I go to prepare your old room.” And moves away. The long chamber beyond, the rich chiarascuro of velvet shadow and blinding light. Small windows, some open to the garden beyond. A cough from a shadow wrapped in robes heaped at the far end of a long table. The clatter of eating utensils thrown on a metal plate. A poor choice of words. Though the Abbot rarely chooses his words carelessly. “Your Grace. I return always at your command, by the fastest roads, God willing.” I bow. I hold the wooden cross that hangs at my side as I rise from my genuflection. To watch the Abbot drink deeply from a goblet of wine. The Abbot stares out at the garden. He is yet to look in my direction. His face is like a painting in a boarded-up room. His lips are stained red with wine. One does not say no to the Abbot. One does his will and therefore, God’s. That night, I sit in my small, bare room, my companions a single candle and an ancient skull—a grisly paperweight—on the table. From a travel-stained satchel I take the parchments I have carried for so long. For hours I stare at the seal, searching for the answer to one question. Why did I not give them to the Abbot? Finally my mind wanders, as I have wandered these last seven years. The old skull stares at me, and I stare back, thinking of the things I have seen. Then I recall the fleeting looks I caught in the corridors of the convento this day. Seeing again the fear, the distrust, and the hatred in the eyes of those I call my brothers. I tuck the scroll deep within my robes. I know that tonight, like so many other nights, I will not sleep at peace. But I am unable to imagine what could await me here, in this place I always thought sanctuary. It is Guglielmo. I see his eyes glint in the dark as inky blue shadows fill with the shapes of table and chair. “You must waken, Brother!” he whispers hoarsely. I stifle my questions, cast off the thin blanket that covers me, rise. My head still full of dark shapes and grinning demons. Guglielmo’s hunched form fills the tiny room like a black cliff outlined against the night sky. We move quietly through the empty corridors. The old man flits ahead. “Come,” he whispers, and in the still night it is like a shout. Beyond a small door we move down a narrow stone staircase. Ahead the glow of torchlight. Who lights these brands to burn through the long night, I wonder? We pass the first torch, through another low door, and I am moving behind Guglielmo into passageways of the convento I have never been, even as a boy. The walls drip with nicre and the cracks are filled with moss. I bend low. Guglielmo has removed a torch from the wall and carries it before him, its flame hissing as it meets the damp ceiling. There is sadness in his voice. But I have not time to think upon it, for we leave the narrow corridor and come out into a long cellar. The ceiling is a low arch of brickwork two handsbreadths above my head. The mud and brick walls are riddled with long, low niches crammed with ancient bones. The left half of the room is a ledge waist high, and on this ledge are more disturbed bones, and stone sepulchres, some open with their heavy lids cast aside. Black mouths in the far wall yawn open to further rooms, or corridors in this ancient place. From them, in silence, file cowled monks. Though their hoods are low I recognise some of the faces. Guglielmo moves to stand before them, next to a figure, bulkier than the others, dressed in rich, heavy robes. “Have you awoken from your sleep Brother?” It is the Abbot. His hands reach up to pull back his cowl. Silver hair turned orange in the restless flickering of torchlight. The lines on his face like black crevasses. “I travel only where your Eminence wills,” I reply, but my voice sounds like the rattle of bones. They move towards me now, the others. There is nowhere to run. And they are my brothers, after all. 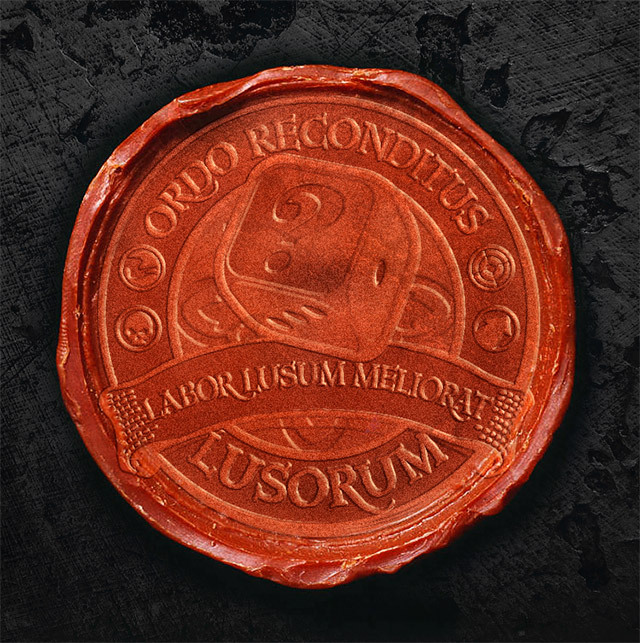 The pictured seal of the Ordo Reconditus Lusorum (now known as the Esoteric Order of Gamers) was discovered in 1923 by Dr Rudolph Stamford while cataloguing a small medieval ossuary underneath St. Scholastica’s Abbey (also known as Subiaco Abbey) in Subiaco, Latium, Italy. It was found with a thick scroll of parchment—there is no further description of this item in the official record—along with the skeletal body of a man, in a sealed sarchophagus. Stamford noted that the skeleton was found in an unusually contorted position. The seal now resides in one of the Order’s private museums, possibly in Berlin. The scroll is thought missing, stolen or destroyed.